Control systems exist in many applications today, from home thermostats and vehicle cruise controls to engine temperature regulation and missile-guidance systems. Many control system designs exist, and one of the newer, more sophisticated concepts in modern control systems is the concept of observers. Observers are algorithms used to predict a system’s response. The chief benefit to using observer control systems is cost. An observer can predict a system’s response without using numerous sensors which can greatly reduce the cost of a system. The observer uses data collected from sensors to predict information that either cannot be measured or is too costly to measure. Also, because the data is derived from the observer and not read from a sensor, the factor of noise is eliminated. With this control method, we can control parameters that cannot be easily measured such as motor current or fluid flow rate. An observer method has been proposed by George Ellis and is based on classical control theory using a PID control law for tuning. This project will focus on Ellis’s method to control the position of two robot arms as well as to determine the advantages and disadvantages of Ellis's method for a robot arm system. In this project, we will implement controllers for two arms which are in different configurations. The first is the “2 degrees of freedom” configuration. 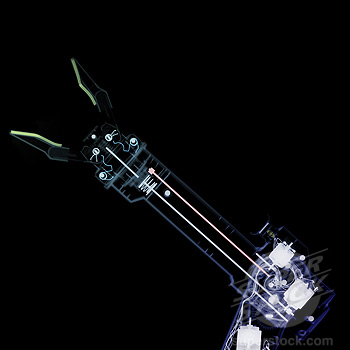 This arm is a level arm that is mounted on the Quanser robot arm system and bound by two springs. The second is a pendulum arm. The goal of this project is to control the arms to have enough speed and accuracy to quickly pass objects of varying mass back and forth.